In a well-publicized 2012 action, the attorneys general of 20 U.S. states stopped a company called QuinStreet from using a military-branded website, GIBill.com, to steer American veterans to controversial for-profit colleges. But it turns out that marketers, including QuinStreet itself, have continued to engage in similar practices since then. Websites such as Military.com and GIJobs.com still push vets and military service members to schools including ITT Tech, Kaplan, and Education Management Corp.’s (EDMC) Art Institutes — institutions that often charge students sky-high prices, spend too little on instruction, and leave dropouts and graduates alike without the careers they sought and buried in student loan debt. The same group of institutions are also under investigation by multiple federal and state law enforcement agencies for deceptive practices or already have paid fines to settle such probes. Not all for-profit colleges do a bad job, and some students benefit from the programs. But many for-profits, driven to please their investors, engage in relentless efforts to sign up new recruits, regardless of likely outcomes, in order to deposit new federal aid checks. Some for-profit colleges get close to 90 percent or more of their revenue from federal student grants and loans; the industry has been receiving as much as $32 billion a year of your tax money. To find the students, many of these colleges spend thousands of dollars per student on marketing and recruiting — much more than they spend on actual education costs — and they often hire outside lead generation companies. As awareness of deceptive and abusive recruiting of U.S. troops and veterans increased a few years ago — President Obama warned soldiers at Fort Stewart, Georgia, in April 2012 that some colleges were “trying to swindle and hoodwink” them — law enforcement agencies started stepping up. In June 2012, state attorneys general Jack Conway (KY), Lisa Madigan (IL), and Beau Biden (DE) came to Washington to announce, at a press conference that also included Obama officials and four U.S. Senators, that 20 state AGs had reached a settlement with Foster City, California-based QuinStreet to turn the GIBill.com web address over to the VA.
Because of the name and the services it offered, some people might have thought they were on a government website, but Quinstreet’s GIBill.com steered people who went there seeking advice on higher education options to for-profit colleges that paid for the privilege. A 2011 version of the site is here, and the recommended “GIBill Schools” are all for-profits. The concern was that veterans and service members would believe it was the government recommending these colleges. In fact, the quality of many schools listed is dubious, and since then several on the list — Kaplan, DeVry, Westwood, the Art Institutes — have been sued or investigated by law enforcement. The state AGs charged QuinStreet with violating consumer protection laws. QuinStreet did not admit responsibility, but in addition to transferring the website, the company agreed to pay a $2.5 million fine and to provide disclosures on “any [military-themed] website owned, operated, maintained, or controlled by QuinStreet that is directed at U.S. consumers and advertises or generates leads for educational institutions” — disclosures clarifying, among other things, that such website is not operated by the U.S. government, that colleges have paid to appear on the site, and that the schools listed on the site are not the only schools that accept GI Bill benefits. Despite the 2012 GIBill.com settlement and the attention it received, deceptive steering of veterans to predatory schools has continued to this day. I discussed these ongoing deceptive practices when I spoke at a workshop on lead generation at the Federal Trade Commission last October. At that event, I mentioned Army.com, which I imagine many visitors might think is associated with the U.S. Army. When I visited that site, an ad popped up for a for-profit school, Grantham University. I don’t see that popup as I write today, but I see front and center of the home page an offer to “Learn About Joining the Army and Your Educational Opportunities” with a box to enter my name and phone number, along with a disclosure familiar to anyone who has studied for-profit college lead generation: “By entering my information and clicking ‘Next >’ I consent to being contacted via phone or text at the phone number above about military and education information.” If you navigate through another box on the homepage, labelled “AFFORDABLE EDUCATION” and select any degree or major, you end up on a landing page for Grantham University. Small print at the very bottom of the Army.com homepage discloses that the site is owned by FanMail.com, L.L.C., not the U.S. Army. Whoever FanMail.com are, they certainly are fans of Grantham University. Another site is GIJobs.com, owned by Victory Media, a company headquartered in Pittsburgh. GIJobs.com has a “School Matchmaker” tool for “Military Friendly Schools.” When I tried the tool last fall, the first four schools that popped up were all for-profit colleges — in order, Kaplan, Stratford University, Colorado Tech, and National University College. Kaplan, which got $877 million last year from taxpayers (down from $1.5 billion in 2010), has a troubling record of misleading students and has been under investigation by multiple law enforcement agencies. Also under examination by law enforcement is the owner of Colorado Tech, Career Education Corp., which got $803 million from in federal money last year (down from $1.9 billion in 2010). More recently the GIJobs matchmaker tool has steered me to the for-profits Academy of Art University in San Francisco, Grantham, and Lincoln Tech, which recently paid $850,000 to students to settle charges brought by the Massachusetts Attorney General that it engaged in coercive recruiting tactics and misled students about job placement success. Victory Media also publishes and promotes an annual, clickable listing of Military Friendly® Schools. The report claims to select the top twenty percent of colleges for veterans — those do the best job of preparing vets for “a vibrant educational experience followed by chances for the most gainful employment afterward.” The latest list includes many for-profit colleges currently under law enforcement investigation, such as Ashford University (owned by Bridgepoint Education; $639 billion in taxpayer money last year) and Kaplan. The list is reported, without questioning the source or methodology, by lazy local media around the country. Dahn Shaulis has persistently raised questions about GIJobs and Victory Media. Shaulis, a U.S. Army veteran who served as an infantry officer in South Korea, has a doctorate in sociology from the University of Nevada-Las Vegas. He has worked as a prison guard, and as a community college adjunct professor, but mostly now he is a determined activist seeking better educational opportunities for his fellow veterans and other students. My client advises that you posted several Linked-In and Twitter posts that are factually incorrect. Regrettably, you have also taken it upon yourself to write to at least one member of the Victory Media advisory board urging that member to resign alleging that Victory Media is involved in wrongdoing related to government contracts. This allegation is patently false and constitutes slander as a matter of law. … Victory Media must insist that you refrain from posting, publishing, and otherwise publicizing factually incorrect information. Your unfounded claims of wrongdoing hurt the military community and those collectively served by Victory Media. We ask that you immediately remove all related postings within social media services and cease and desist all activities related to this matter within 24 hours of receipt of this correspondence. Allow this letter to place you on notice that Victory Media will take any and all legal measures necessary to protect its good name and reputation. Malkin’s letter did not provide specifics about what facts Shaulis alleged that Victory believed was false. Shaulis did not remove his posts, and Victory Media has taken no action against him. The site clearly is popular. As Shaulis pointed out in a LinkedIn post, a Google search for “GI Bill and Education” brings up a number of Military.com links on the very first search page, just below links from the VA. Remember QuinStreet, the operator of GIBill.com? In order to get recommendations for colleges, the QuinStreet-“powered” feature on Military.com requires a visitor to provide detailed personal information, including address, phone number, email, date of birth, education, and military service. Shaulis’s searches on the site (see images below) led straight to for-profit colleges, including Kaplan and Lincoln Tech, as well as ITT Tech and the Art Institutes. EDMC, which operates the Art Institutes, and ITT are two of the top eight for-profit college companies in terms of federal revenue last year ($1.47 billion and $664 million, respectively). Both companies are in precarious financial condition, and each faces numerous federal and state law enforcement probes today. College searches that I conducted on Military.com in the past few days brought up the very same group of for-profit colleges, along with Career Education Corp.’s American Intercontinental University, and Full Sail University, the for-profit college touted on the 2012 campaign trail (and, it turned out, partly owned) by Mitt Romney. Military.com’s president is retired Rear Admiral Greg Smith. When I called him, Smith told me that the colleges to which visitors to Military.com get referred are under the control of QuinStreet, not his company; “All the clients are their [QuinStreet’s] clients — that’s not part of our business,” he said. He also said that he had no plans to sever the relationship with QuinStreet. I asked Smith if he had concerns that his site, in association with QuinStreet, was sending veterans to poor quality schools. He referred me, for further comment, to a Military.com communications official. That spokesperson has not yet responded to me. Q: Does QuinStreet have any concerns about its arrangement with Military.com, including legal concerns? Q: Does QuinStreet believe this arrangement is consistent with its settlement with 20 state attorneys general in 2012 regarding the website GIBill.com? 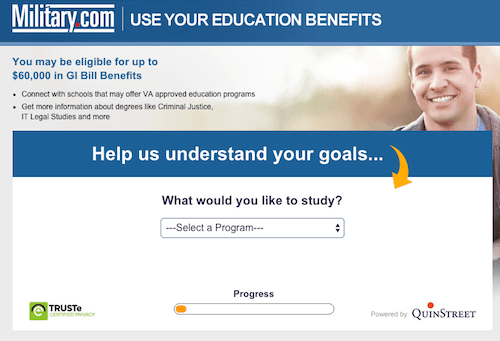 As Shaulis points out, Military.com could instead connect visitors to government college finder sites — the Department of Education’s College Navigator and the VA’s GI Bill Comparison Tool. In fact, the VA site now includes caution flags warning students about legal and administrative actions by government agencies for misconduct or financial instability against certain schools. The VA currently has caution flags on ITT, EDMC, DeVry, and Career Education Corp. schools, among others. But Military.com uses QuinStreet instead, a service that refers to students to colleges that, as with GIBill.com, pay for the listing. At the conclusion of the FTC workshop in October, FTC official Malini Mithal said, “I … predict that on the law enforcement front I think it’s likely we will continue to look at unlawful practices involving lead generators and we’ll bring enforcement actions where appropriate.” The FTC, which for years did not pursue the deceptive practices of the for-profit college industry, has recently, under Chairwoman Edith Ramirez, taken important steps to go after misconduct, including a lawsuit filed last week against DeVry University, and investigations of Career Education Corp. and the University of Phoenix. At the very least, the operators of these military-themed websites do a disservice to our troops and veterans when they present themselves as military-friendly outfits and then sell to the highest bidder their recommendations as to where to spend precious educational dollars — and often recommend overpriced, substandard, dishonest colleges. Those same colleges, which reap billions in taxpayer money from these shoddy practices, bear responsibility too, and they also should be held accountable.